A2600 Raiders of the Lost Ark (USA) in 01:34.6 by adelikat. 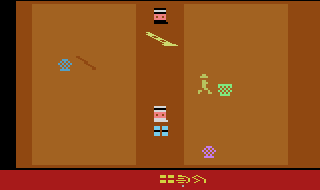 Raiders of the Lost Ark for Atari 2600 is the first ever movie licensed video game. To complete the game, Indiana Jones must find the titular Ark - resemblance to the movie is limited aside from this. In this movie, adelikat finds the Lost Ark of the Covenant in a record-breaking 1:34.59. For details on how he did it, read the author's comments.